I remember sitting my office at Silverado Resort, when my buddy Gary – referring to how I handled a recent situation – made the comment that I was the poster girl for the “when life gives you lemons, make lemonade” sound bite. He meant it as a compliment and I took it as such, referring back to it often. I mean, that’s a good thing, right? Make the best of any given situation, right? So I liked being associated with it. So now I had a new motto, which I was very happy with. Until last Wednesday. It was during my 45 minute drive back from the main campus. Traffic was slow, radio reception was static-ky and my iPod was at home, so my thoughts wandered back to that sound bite. 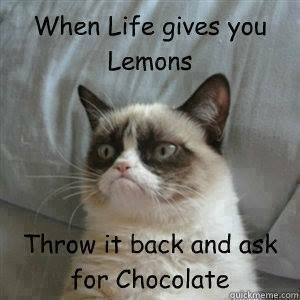 Give back the lemons and ask for chocolate. What a concept. But what kind of chocolate would I want? Godiva? A chocolate truffle? Wait. What if I only get a Hershey’s bar, like at the checkout counter at Safeway? I mean, nothing against Hershey’s but that’s pretty … ordinary. Shouldn’t I ask for something better? I could at least score one of those Cadbury eggs that they only sell around Easter. The more I thought, the more I realized that – as much as I love chocolate – I knew I could do better. Stuck in traffic, I tried to think of my most favorite taste sensation ever. What has made my taste buds sing beyond all else? As evidenced by my current plus size slacks, I dearly love food. So could I even think of a favorite? Is there an ultimate? Traffic finally began to move, so I put the thought aside. 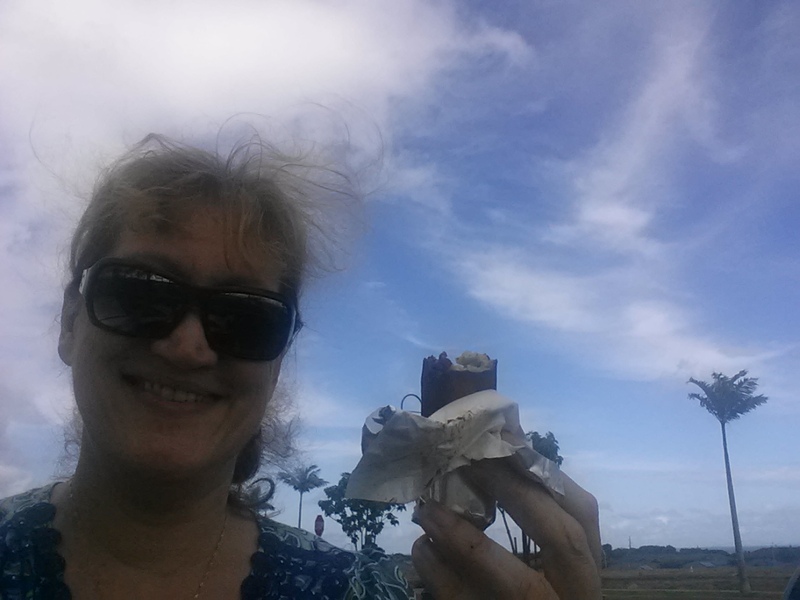 But then somewhere around Maalaea it hit me: I knew the answer! When I was about seven years old, my aunt Mary took me to an upscale Pittsburgh department store that had a candy counter brimming with hand made items. Looking into the case, I saw these perfectly shaped tiny little fruits that weren’t really fruit. OMG, they were beautiful! Lost in these miniature wonders, I thought I heard the crisply uniformed candy clerk calling my name. Relieved that I wasn’t being scolded, I stole a side eye glance at my aunt. “Would you like to try one, honey?” the candy clerk lady asked, while handing me a tiny little apple, formed and colored to perfection, shading and all. Aunt Mary gave an affirmative nod. “Yes, thank you,“ I said while reaching for the delicacy. Carefully, slowly, I took a bite. Now I may not be remembering this accurately but I swear – a choir came out of the sky and beautiful harps began to play. Angels floated by and lifted me up onto a cloud. It was the most heavenly bite I’d ever tasted in my life. Who knew that if you took blanched almonds and smooshed them together with a lot of sugar, it could taste like that? Oh … my … goodness. If life gives you lemons, give ‘em back and ask for marzipan. And could you dip in it chocolate, please? 9 Responses to "Beyond Chocolate?" I will get some for both of us! I’ll stick with chocolate for my final third…especially surrounded in ice cream! Wait. Chocolate surrounded by ice cream, or ice cream surrounded by chocolate? Win/win…throw some peanut butter in there and you have a total blow-out. 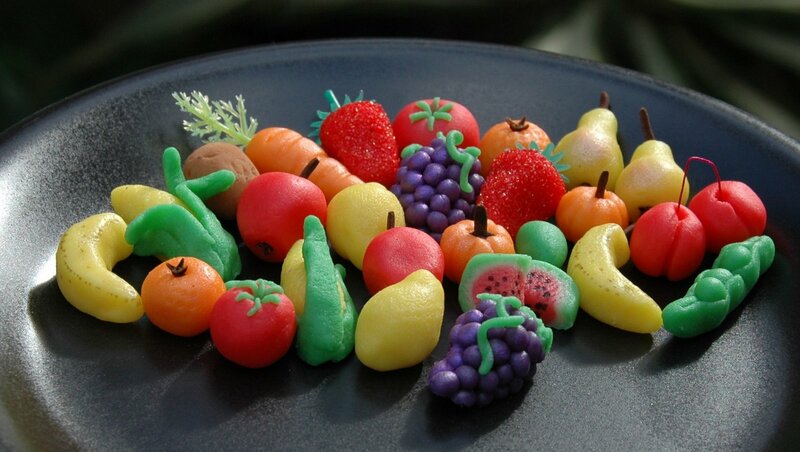 Oh yum, love marzipan too! i love your writing! chocolate and peanut butter also sounds good to me. Aw man… now I want a Reese’s cup!